The ideal credit union's headquarters branch represents an opportunity for research and development and staff training, and helps reinforce to the staff that the branch is still largely seen as the face of the organization. If you ever have the opportunity to visit the Starbucks headquarters in Seattle, stop in the coffee shop inside. Step out of the elevator into a tall, sky-lit space filled with the aroma of roasting coffee and experience the same employee friendliness you have come to expect at your corner Starbucks. Behind the scenes, down a floor, the taste team tests more than 600 cups of coffee daily in a private “cupping room” as new blends are prepared for market. However, in the tightly regulated financial industry, deploying new products is not as simple as taste-testing a cup of coffee. Rigorous testing is required and credit union employees must be trained to use new tools to enhance the member experience, and in a way consistent with the organization’s cultivated brand experience. But just like that coffee shop in the Starbucks headquarters, the credit union headquarters branch represents an opportunity for research and development and staff training while helping to reinforce to the staff that the branch is still largely seen as the face of the organization. To be competitive, credit unions are expanding online and mobile services. Members have little patience with apps that don’t make their banking experience easier. In the headquarters, IT and product experts can more easily co-locate in the HQ branch to test these technologies with members prior to their general release. The marketing department can also leverage the HQ branch for R&D. Does the organization have a new marketing campaign? Try it on for size in the branch downstairs, make adjustments, and then roll it out. 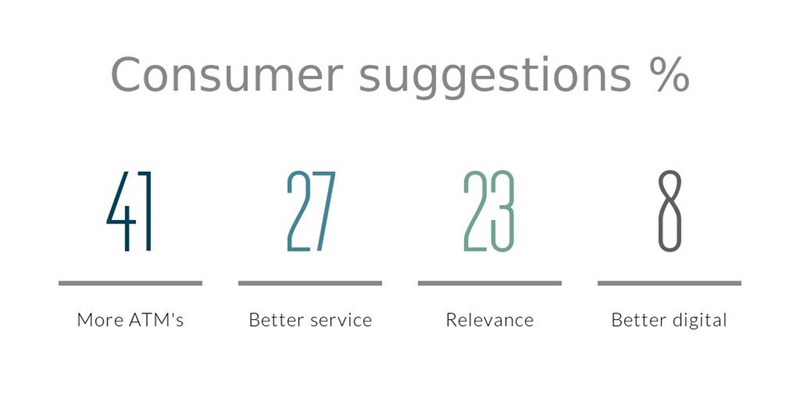 According to the 2011 PwC FS Viewpoint Report, 27% of consumers suggested they need better service. Staff training is crucial to delivering a world-class member service experience. When a headquarters branch functions as a live classroom, the credit union’s training team has the opportunity to connect new hires more directly to the mission of the organization. Source: “Getting to Know You: Building a Customer-Centric Business Model for Retail Banks” PwC FS Viewpoint. April 2011, p.23. The connection of the branch with an organization’s administrative functions can have a powerful visual impact as well. For Golden Plains Credit Union it says, “This is the most successful financial institution in town.” The building’s scale and its branch functions send a clear message that this credit union is an enduring part of the area’s economic vitality. The per-transaction cost of the traditional branch delivery model is increasing. Credit unions are continuously looking for ways to leverage more from their expensive facility assets. One way credit unions have found greater returns is through creating synergies between the administrative functions of the credit union and the HQ branch. Ask yourself, what opportunities does your credit union have to test and try out new products, campaigns, and strategies in your HQ branch? Click here to request a copy of “HQ Branch is A Unique Animal” white paper for additional HQ branch case studies. Momentum is a national integrated design-build firm. For the past decade, purpose-driven organizations have come to Momentum to visualize and create innovative customized facilities that align with their business strategy, empower people and aid in developing a sustainable long-term growth plan. For more information, call 206-787-8084 or visit www.momentumbuilds.com.